If you haven’t caught up with yesterday’s Made by Hand post, please click here. 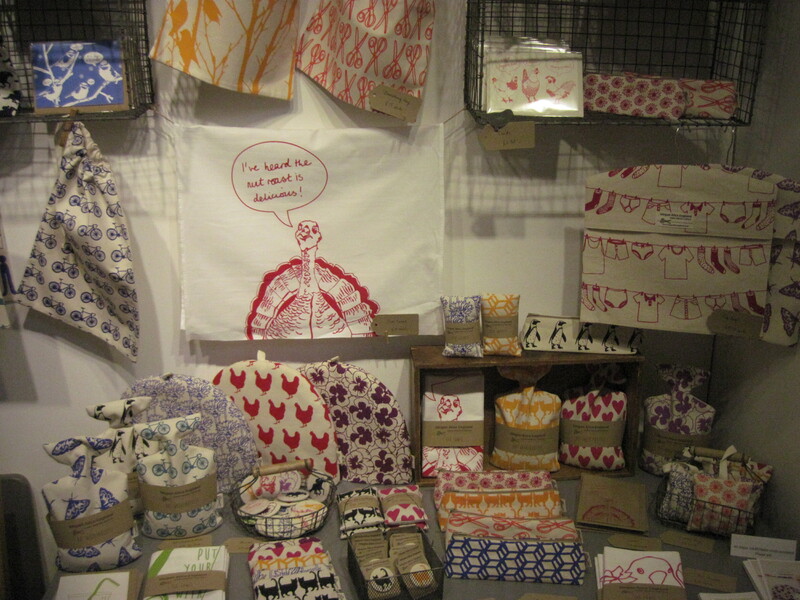 As I mentioned yesterday, there were some great designers and products at the Made by Hand craft fair. So much so, in fact, that I’ve decided that the fair warrants two posts. 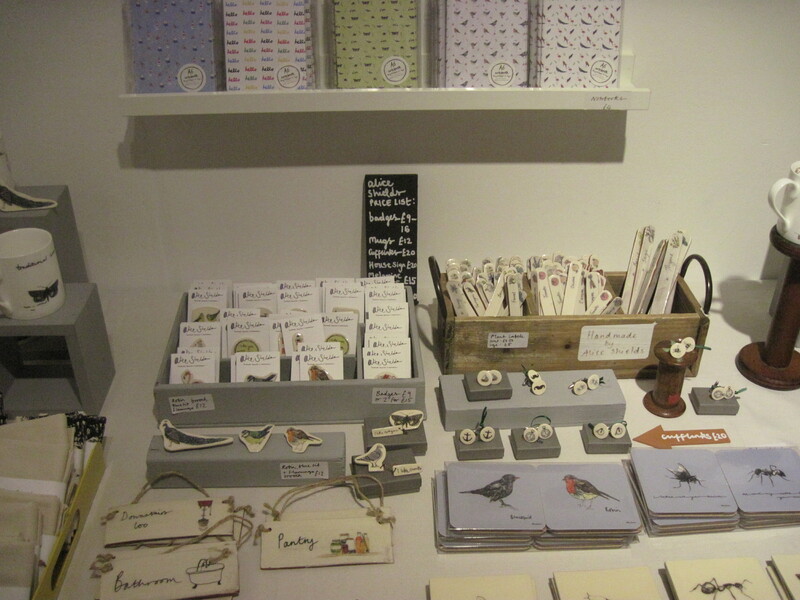 I’m often drawn to colours and quirky designs, so I was glad to see plenty of products that fitted the bill at the fair. This time I’ve featured my favourite jewellery, ceramics, prints and embroidery. Have a read about each artist and click onto their sites if you’d like to know more. 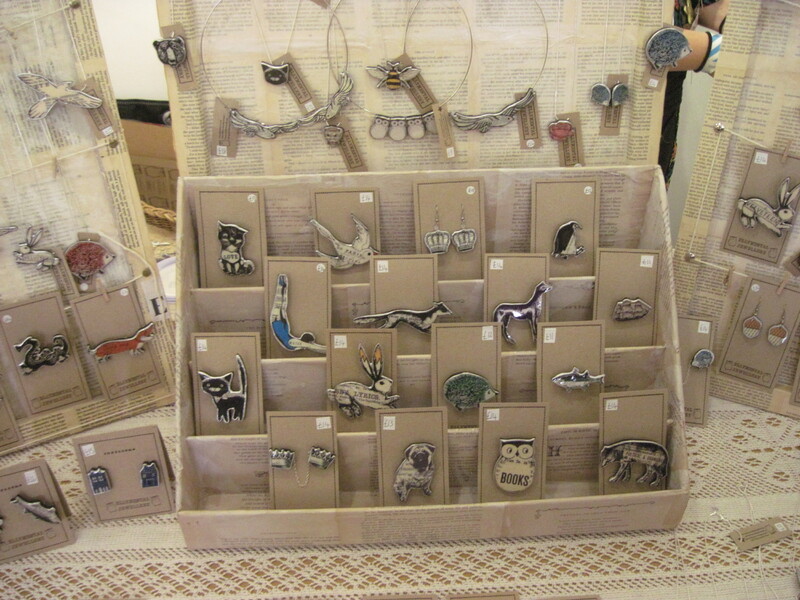 Ellymental lives and works in Cardiff where she sells jewellery pieces inspired by animals and collage. Her work is stocked in shops and galleries across the UK and it’s easy to see why. Each piece is lovingly made and whimsical. You can buy her work on her website or her Folksy shop and you can follow her on Twitter here. Bryony Stanford is based in Shropshire and graduated from Birmingham’s School of Jewellery with a BA (Hons) degree in Jewellery and Silversmithing. 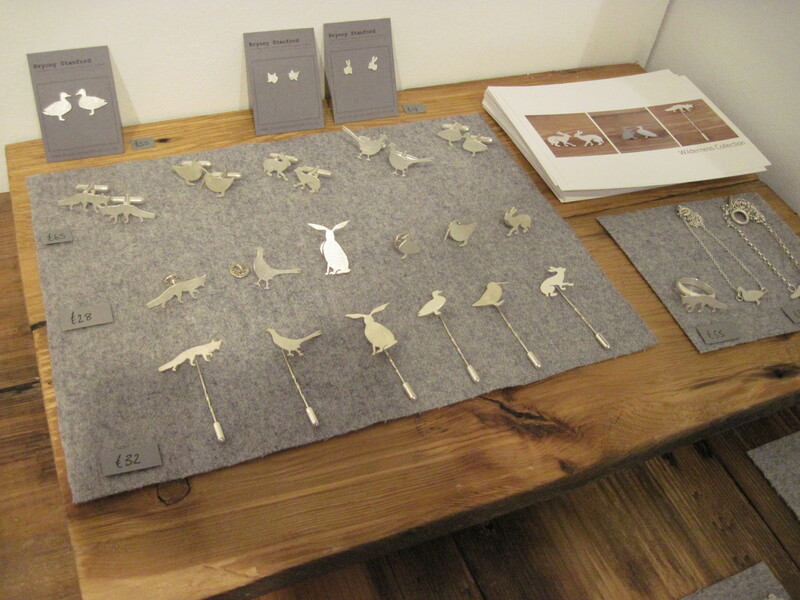 Her work, such as the animal pins featured above, often features the relationship between construction and deconstruction and she uses different textures and finishes to make each piece unique. You can find her on Twitter or Facebook and she also sells on Not on the High Street. 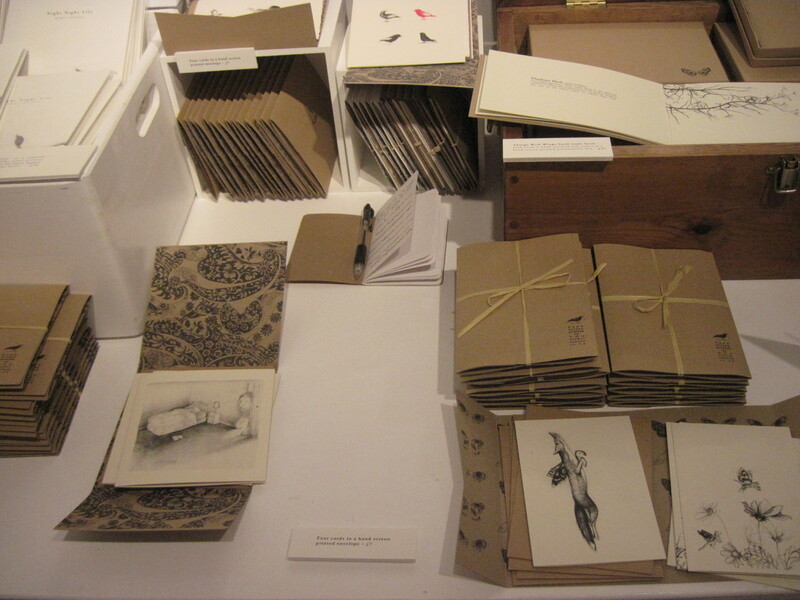 What I particularly loved about Esther Connon’s work is that she creates children’s books from her beautiful drawings. Esther works from a studio on the north coast of Cornwall which actually happens to be her old grammar school. She has always had a passion for storytelling but uses minimal or no text, instead using her drawings to tell the story. You can find out more here. I’ve encountered Alice Shields’s work before, last year. The ceramicist’s products are inspired by the outside as well as the eccentricities of British style and she creates beautiful pieces for the house, the garden or for adorning clothes. Each piece is handmade and you can follow her adventures here or here. 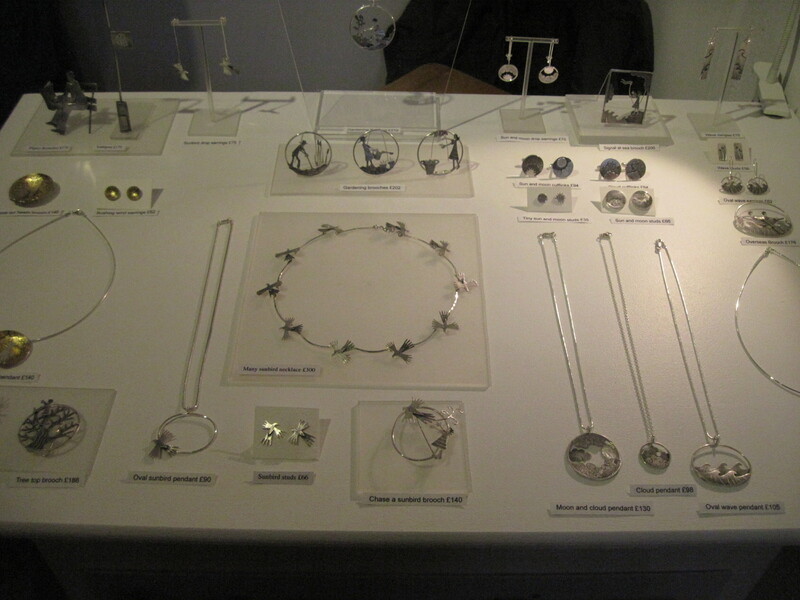 Becky Crow’s wonderful silver jewellery is definitely something to put on the Christmas wishlist. Becky uses sheet silver and copper to create her unique pieces and works from a studio in Brighton. Her work features images of nature and people and you can find out more about the pieces on her website. 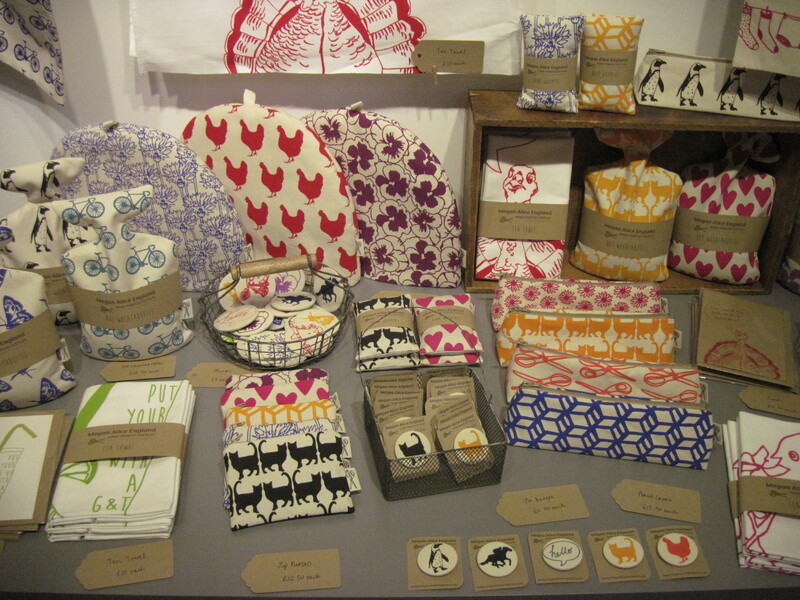 I just loved the colours of Megan Alice England’s hand printed textiles. Megan creates each piece from scratch, designing, printing and sewing from her studio in Cheltenham. You can buy her work on Etsy and Not on the High Street and follow her on Twitter here. 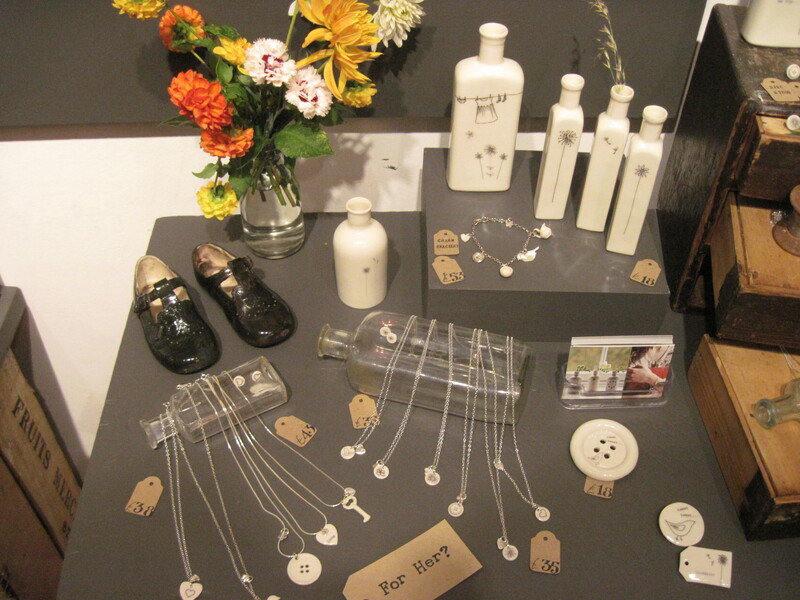 Creator of Boop Design, Laura Pearcey, uses stories from her childhood to inspire her ceramics and jewellery. I particularly loved Laura’s bottles, like the ones shown in the above photo, for their individuality and sweet floral and button designs. You can find more of Laura’s work via her Facebook or Twitter. And finally, I somehow managed to miss By Kirsty on my first trip around, but I’m so glad I went back for a second look as I ended up buying one of the wooden alphabet brooches from here. 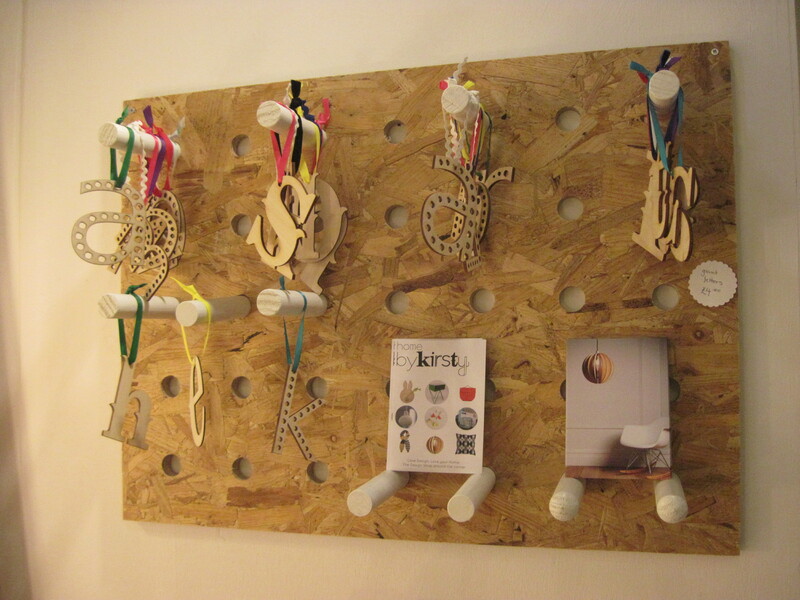 Designer Kirsty Patrick specialises in wood and acrylic and also has a shop based in the Cardiff arcades (one of my favourite places) selling homeware by British designers. You can find out more here or here. Yesterday, I ventured out to Cardiff’s own Buffalo boutique, a vintage fair held on the last monday of every month, in Buffalo, on Windsor Place. The fair did not disappoint and, as always, I loved every minute. The organisers did a great job, combining handmade items with the preloved and there were many different stalls selling things ranging from clothes to jewellery and even cards. The fair was held upstairs in Buffalo, and the bar atmosphere certainly made it seem like a great place to spend some time. And with an exclusive catwalk show, what better way to spend some money than by giving money to some independent designers and clothes sellers? And with the demise of the Rose Tinted Vintage fairs last year, I was happy to hear that Cardiff once again had an affordable monthly vintage fair, which I am sure will be just as popular as its predecessor. The next fair will be held on the 25th March and more information can be found on the event’s Facebook page here. Anyway, onto the purchases. 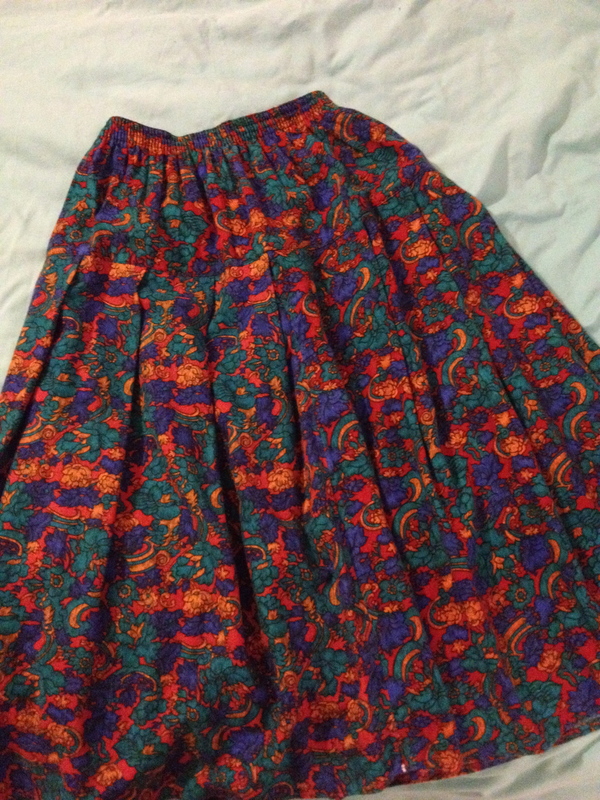 There were plenty of things I could have bought, including a blouse that I also fell in love with, lovingly handmade by the seller’s grandmother, but as I was on a budget, I set myself a limit and, as a result, I only bought one thing, this skirt. The skirt is quite a small fit, but I am already imagining myself styling it up in the summer with some brogues and a simple white tee. And, like with all the clothes I buy, I am so excited to wear it. 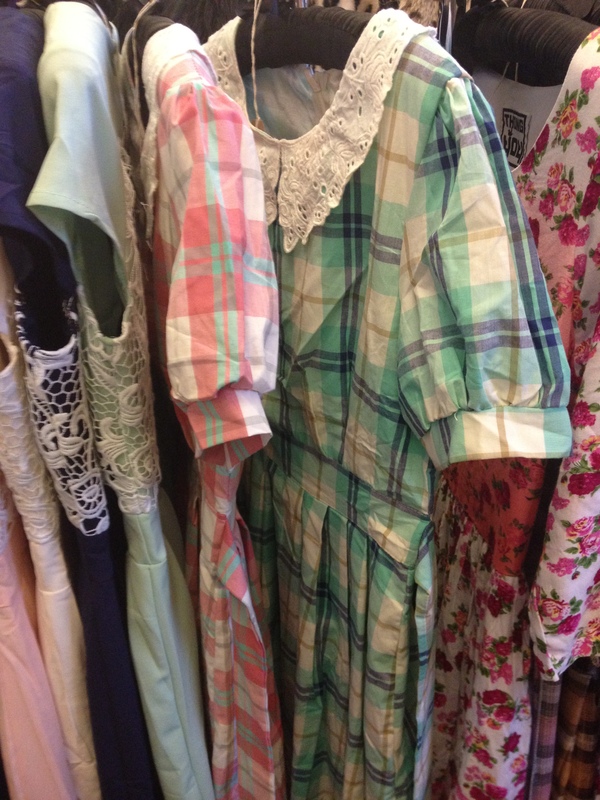 A new vintage market selling clothes and crafts will open in Cardiff this weekend. 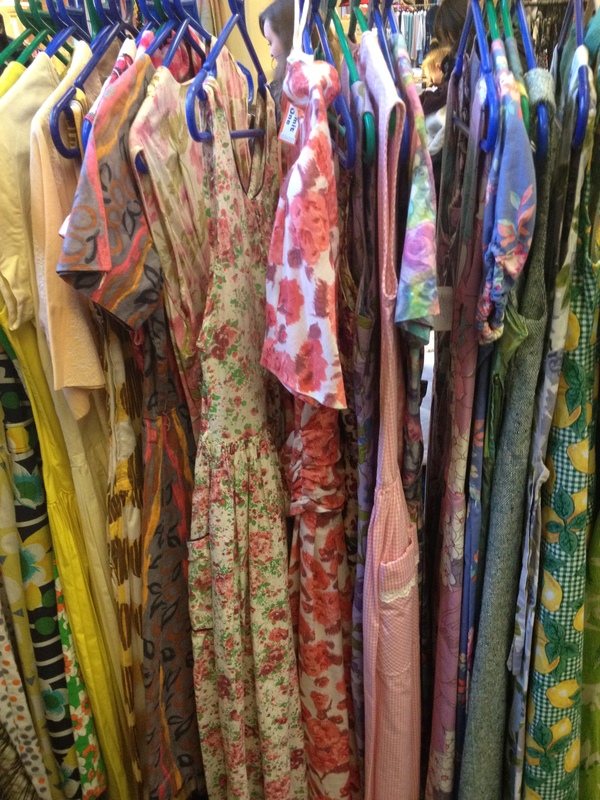 The market will launch outside the indoor market, on St Mary’s Street, tomorrow and will sell vintage clothing, arts and crafts, homeware and even garden items. It has been set up with support from the RCMA and there will be performances to celebrate its launch this weekend. The weekly market will run from 11am until 5pm on a Saturday. A link to the original article, via Wales Online, can be found here. 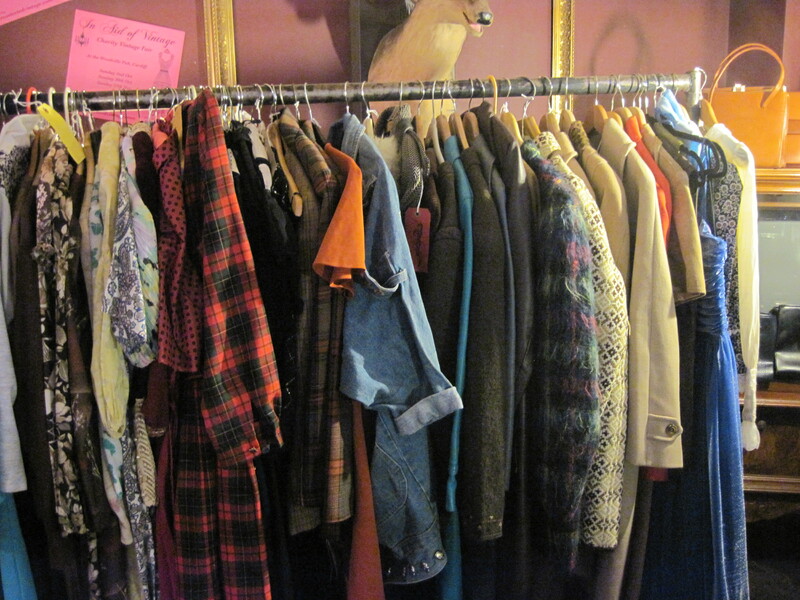 Every month, Milgi’s host a £1 jumble sale in the warehouse behind their restaurant. Last Sunday, I went along for a browse. Milgi’s is a wonderful place and I felt completely at home as soon as I got there. I’m ashamed to say that, in ten months of living in Cardiff, I had never been, so of course I was eager to go. I wasn’t disappointed either. My friend told me that their milkshakes were to die for and my banana one certainly lived up to expectations. But anyway, back to the clothes. 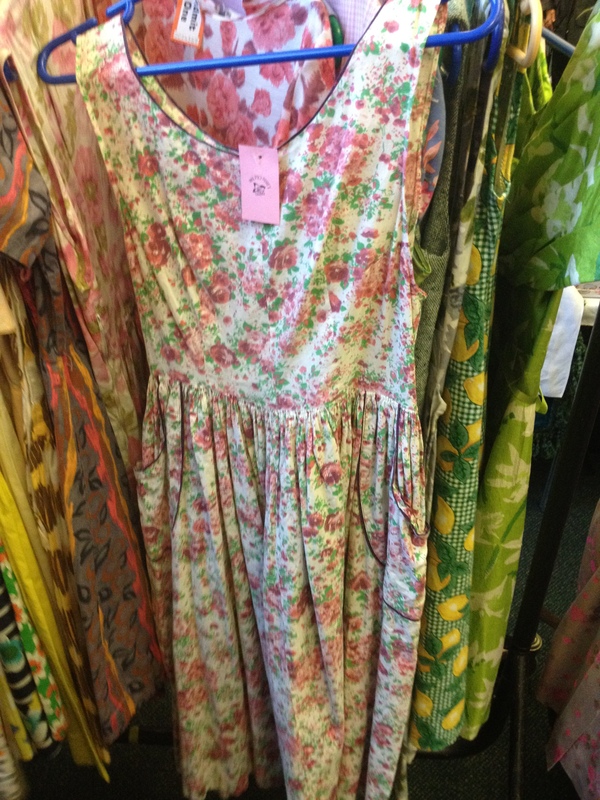 A jumble sale is a perfect way to grab some bargains and at Milgi’s, everything was a pound. As you can imagine, a sale where everything is that cheap certainly brought in the punters and the small space soon packed out. For anyone planning on going to the next one, I’d advise you get there early, for the above reason and to grab yourself the best items. I came away with a Topshop cardigan (in very good condition), a top (which was only slightly too big) and two bags of fabric offcuts, for only £1.50. All for the very reasonable sum of £3.50. Information on the next event can be found on their website.